In 2012 I – Max Höfler – bought some guns for an Austrian art association called Forum Stadtpark. The purchase of these guns established a situation that focuses on the most abstract entity we do have in our today society and that concerns us all: Money and all these financial issues that are considered as the basic structure of our society. To experience this abstract relation between us and the finance I transformed it into a concrete situation. 1.) The Forum Stadtpark spent a lot of money for these rifles: 10.000€. 2.) These guns still work. That means that you can still use them and that they had been already used before. 3.) The value of these rifles will rise because they aren’t produced any longer and they are rare. So they are some kind of a financial investment for the Forum Stadtpark as well. 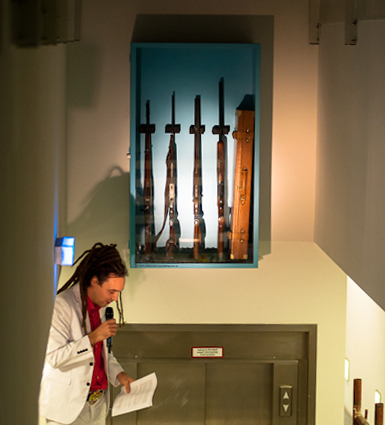 After I bought these guns, I put them into a vitrine in the foyer of the Forum Stadtpark where they still are as an sort of permanent virulent inventory that questions how we can get out of this paradoxical situation. Now in 2013 three artist – Andreas Heller, Johannes Schrettle and me (Max Höfler) – want to transform this situation into a new form: into some sort of a performance called “IG Sterben”. This performance is subtitled as a musical. Andreas Heller will act as nature in a wheelchair, Johannes Schrettle as love in a jogging suit and me as immanent danger. Furthermore we will form a no band band called “IG Sterben”. Our first rehearsal will be directly at the performance. In this radia show you will get an insight of this transformational process and you will somehow get to know, what all these things may have in common. This entry was posted in #31 and tagged Radio Helsinki. Bookmark the permalink.